Since it would be somewhat biased to make a review, let me just share to you some things (dirty little secrets!) you need to know about Pablo’s Pizza. EXCLUSIVE!!! Thanks to Ms. Leah Sia for sharing! 1. 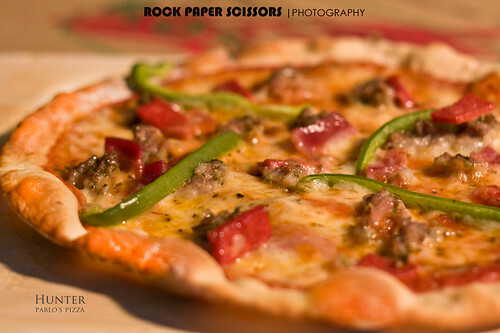 What made you decide to open a pizza place? LS: During college, my dad was sort of worrying what I was going to do with my life since the course I took, which was Fine Arts, was not exactly career-tastic. Let;s just say that my life revolved around art and the idea of creating something for myself. My innate plan was to find a job after school, then save up enough money for film school since I always wanted to do directing. One day, my bro gave my mom a present “Pizza” which had really childish recipes. My dad pressed on me that I should study pizza- making so I can earn mega-cash. To make a long story short, I thought the pizza-business idea was stupid. For reasons like, I don’t eat pizza, too many competitors, and I just don’t have a passion for it. But for some reason it has become my life now! LS: Neapolitan style, had I not discovered it, I would still hate pizza-making. Being a little bit of a rebel, it has quite become a trait of mine to have to be different. I think commercial pizza’s are too generic. With the pizza that I make from the store everyday – it takes A LOT just to make one pizza. It takes time and effort – from start to finish just to make one. I suppose I fell in love with the Neapolitan movement simply because it’s an artisan approach to pizza-making. It’s authentic as well. FYI pizza’s in Italy look nothing like our pizza’s here. It took me about a year to learn it all by myself and went through a lot of mistakes. There’s just a lot to learn about pizza. It’s really hard. 3. Why is the name Pablo’s Pizza? What’s the story behind it? 4. 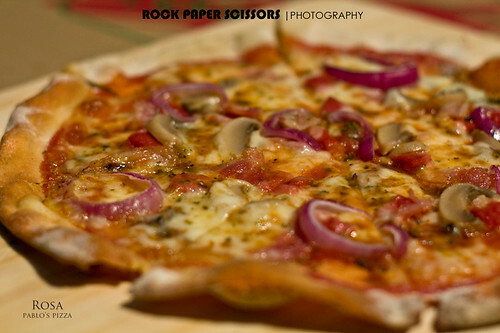 There are a lot of pizza restaurants here in Cebu, what can you offer that is different from the rest? What can I offer? I offer them the truth. I serve REAL mozzarella, which I get imported from Denmark (that’s why it’s white). Real mozzarella isn’t yellow. Some pizza-places here especially the more prominent names tend to mix quickmelt with milk because it’s cheap. And although, getting Danish Cheese imported weekly costs me a ton of money, I do it because it’s the best. I’d like to offer people nothing but the best. I make the italian sausage myself. It’s made with real pork (I won’t give you something that looks like a hotdog! ). I make the dough fresh everyday; I don’t use lard, shortening or margarine. I use extra virgin olive oil. We bake the pizzas in a brick oven, just as they would in Italy. 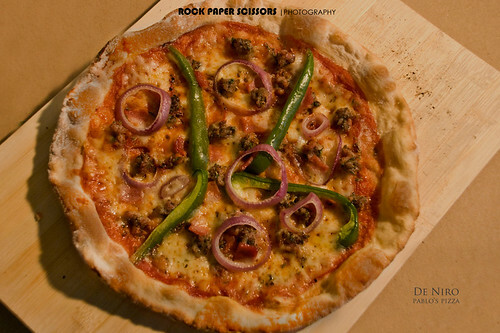 I make pizza with an Italian sensibility but I tweak it enough so it becomes appealing to the average Filipino. I’d like people to realize that pizza should be a marriage between the dough and toppings and not just about the toppings. I guess I want people to know what pizza should be. I can’t say that I’m the best in town since I’m still learning. But as of right now, I know this is the best that I can give them. People tend to get this itch into categorizing “pizzas.” When they say New york style, or Chicago-style, or Neapolitan, it usually pertains to the dough or crust. New York tend to be more “dough-y”. It’s more crisp on the outside and chewy… If people want New York Style pizza here in Cebu – it’s Sbarro. There’s no thick crust in Italy. It just doesn’t exist. They do have the “Sicilian-style,” it still looks different. And they are cut into squares. So there you go! What are you waiting for? Order one now! As in now na! Tara na! Long time no hear, indeed! Thanks Jeff for this post. Thanks again! Hope business is doing well. yes chelle. gilami-an jud mi ato ni eyean. 🙂 thanks leah! kung duol lang jud ni sa amo ay, nagbalik-balik na unta mig bisita ron. hello guys, thanks sa post! much appreciated, glad u could squeeze me in your busy skeds.. anyway I should probobly say that Ill be opening in Escario soon.. perhaps next year pa. Salamat! This pizza looks yummy do they do delivery? Yeah, everyone just call 505-0984. Operation hours are: Sun – Wed: 3pm – 10.30 pm. Thurs – Sat: 11am – 10.30pm. Yum,looks yummy, I tried it. Guys, I also commented about it on Yummy Cebu! @toni b> care to share the link?